We take a look back over the last three decades and celebrate our heritage and the furniture styles that have grown with us. “Lynn and Sibley make an awesome creative team who thrive on creativity, inspirational products and design.” - Paul McAdam. 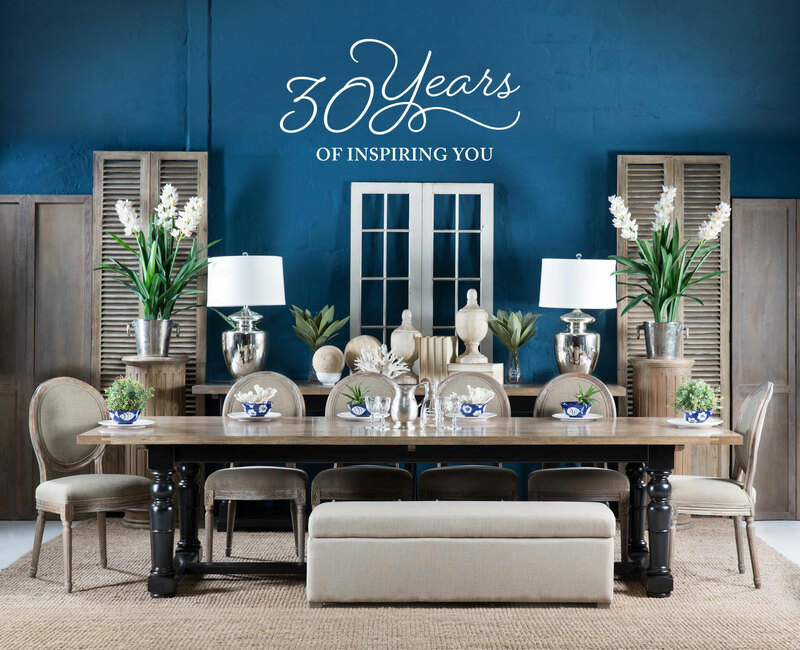 In 2017 Block & Chisel turns 30, a significant age for any business, but especially so since our growth has been thanks to sharing our lovingly made and selected furniture pieces with you. Driven by our passion for antique and handcrafted furniture, as well as its dedication to bringing only the most outstanding pieces to its customers, Block & Chisel has grown naturally over the past three decades, starting from humble beginnings in 1987. Founders Sibley and Lynn McAdam first began this journey with Sibley’s passion for restoring antique furniture and Lynn’s eye for beautiful pieces. Together with a small, dedicated team, Sibley began to design his own pieces and experiment with styling to create a worn, antique look. Together, they learnt by trial and error, eventually developing unique painting techniques that gave Block & Chisel’s pieces a distressed look. Sibley’s workshop team carefully developed the most exact templates to ensure that every detail was precisely executed for an exceptional finished product. The husband and wife team believe that style has little meaning without being truly functional, which is why Sibley created items that are sturdy and unfussy - built to last with plenty of style to boot. The signs of wear and tear that each piece develops with use only contribute to its character, helping it to age with a timeless grace. The company's foundations are in classic French and English Country styling, with free-flowing silhouettes, first introduced by Sibley in the early years and carried right through to today. More contemporary designs have been introduced over the years, including the minimalist Lillian Collection characterised by its wrought iron bases. Each Block & Chisel piece is individually designed to stand alone, never depending on similar pieces to make it work. This allows you the freedom to experiment with style and to find the way in which a piece fits into your life based on your preferences and requirements. The past 15 years has seen Block & Chisel welcome the McAdams’s son and daughter into the fold. Each family member contributes their unique skill to the business, resulting in Block & Chisel’s ever-growing excellence. In the past decade alone, Block & Chisel has seen exciting new style developments inspired by the modern styling. The artichoke finish with its natural red hue introduced in 2016 offers customers a bold option in for Block & Chisel’s classic French Country and English Country styles. Visit our timeline to view our progression through the past 30 years. Though certainly larger than it was 30 years ago when Block & Chisel opened its first store, its family remains dedicated to excellence in all that it does. Here’s to another 30 years of inspiration.